Holy Cow! I wouldn’t believe this deal if I hadn’t seen it with my own eyes, and yet it’s true: during the Macy’s Black Friday Sale, you can get 17 cookware items under $10. That’s not the case with this deal. You’ll notice the first 17 items are on sale for $19.99. Select as many or as little as you like, add to your cart and checkout. Get the rebate and fill it out. You’ll be sent $10 back per item, bringing the final price of each item to just $9.99! All Submissions must be mailed and postmarked no later than 30 days from purchase. Victoria 12″ Cast Iron Skillet- Originally $39.99, on sale for $19.99, and ONLY $9.99 after mail-in rebate! Tools of the Trade Hard-Anodized 8-Qt. Casserole with Lid- originally $59.99, on sale for $19.99, and only $9.99 after mail-in rebate! Belgique Hard Anodized Nonstick Fry Pan Set, 10″ & 12″- originally $69.99, on sale for $19.99, and only $9.99 with mail-in rebate! 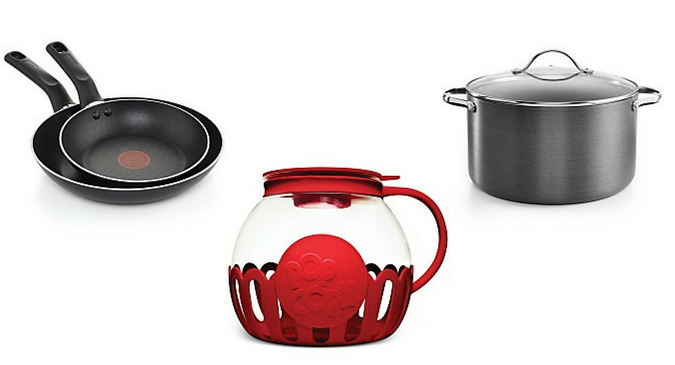 These are just 3 of the 17 cookware items valid for the rebate. My favorite deal just may be the T-Fal Culinaire Champagne 5-Qt. Jumbo Cooker. I thought I got an incredible deal when I scored this for $19.99 earlier this year, but with the rebate, it makes it half off even that price. These deals are too good to pass by and would make great holiday gifts. You could even buy them now and save them to give as housewarming gifts throughout the year. Whether you decide to keep them for yourself or give them away, you’ll know you’ll be getting the best deal possible. Don’t miss out – start shopping now!